Alice breathed in the fresh spring air and looked upward through the tree branches where the sun glistened and danced through the leaves. The lane to her Aunt and Uncle’s home was narrow and not suitable for vehicles. She wondered how her Aunt and Uncle managed to shop but maybe there was some sort of short cut she was unaware of; after all, she had only been with them for three days. The pain hit her in the chest unexpectedly and completely. Her legs gave way and she landed heavily on her knees on the gravel. Tears flowed and her sobbing filled the air startling several chattering birds into silence. They’re gone…forever. Aunt and Uncle are so kind but I miss my parents so much. A rabbit hopped across the lane in front of Alice. She looked at its white tail bobbing up and down. Wiping her nose and wet cheeks with her sleeve, Alice stood up and brushed the debris from her knees. There were small pits in the flesh where small stones had pressed into her skin. I have to be brave, that’s what Uncle says. Wiping away a stray tear, Alice breathed in deeply and began walking toward the lane’s end again. Dwelling on it will stop you healing, Alice. Remember the good times with them, my dear. Her aunt wisdom echoed in her mind. She understood nothing would change the fact her parents were dead but it still hurt and the previous year with no-one to comfort her had taken its toll. When her Aunt and Uncle appeared at the care home, Alice felt saved. A car’s horn sounding brought her out of her thoughts. She looked up to see Bernadette waving at her from the vehicle’s rear window. Alice ran toward her friend, her only friend so far in this small town in the middle of a forested valley. An hour later, Gregor joined Cattrine, complaining the pen’s inhabitants were too noisy and his ears hurt. Given a much nicer task, Gregor cheered up and pushed the mince into the sausage machine, as Cattrine guided the sausage skin ensuring the meat encased evenly. She expertly twisted the skin without hindering the flow to form perfect sausages. When the machine was empty of meat, Cattrine laid the long string of sausages out along the counter. Cattrine turned to Gregor with a smile. She gave Gregor a large rectangular pan and he began laying the sausage tube in lines back and forth. Cattrine cut four sausages off one end and took a frying pan from the shelf. While they sizzled in the pan, Gregor filled the tray and then put it into a large freezer hidden at the back of the pantry. After consuming the delicious morsels, they both licked their lips and giggled. Free meat was more delicious than bought meat. I began a ‘short’ story for children but somehow it is getting longer and longer. So I will post excerpts of it for your enjoyment and that of your children! It’s eyes widened as it grew closer and closer to her face. Alice was paralyzed with fear, clutching her bedcovers with white knuckled fingers. The creature’s mauve skin glistened with slime and drops fell onto its spindly pointed claws. Alice opened and closed her mouth willing her voice to sound in the dark bedroom. 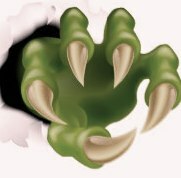 The claws clicked together as the monster’s jaw opened. Click, click, clickety, click. Alice’s scream woke her. She was drenched in sweat; her heart beating so fast it hurt her chest. She had no idea how long she screamed but her throat was sore. Shortly after waking, she heard her uncle’s thundering footsteps coming up the stairs. The noise drowned out her aunt’s voice full of concern and Alice’s fear induced tears. The bedroom door flew open and Alice’s uncle stood in the doorway, looking around the room before rushing to the bed and embracing Alice. Alice tried to stop her crying in an effort to answer him as her voice croaked and her body shuddered. Alice’s Aunt walked into the room slightly out of breath with a panicked look on her face. Her aunt stroked Alice’s hair before exiting the room giving her husband a quick wink as she left. With her uncle’s strong arms around her, Alice felt safe and calmed down as her heartbeat resumed a normal beat. Once she finished her milk, her aunt and uncle left her to sleep the rest of the night with the small lamp lit. They told her to call them if she had another bad dream. Alice drew her bedclothes up as far as she could and curled up into a ball. She watched shadow branches on the wall closest to the door for some time before her eyelids grew heavy and sleep claimed her. Click, click, clickety, click. His claws tapped together as he sat in the corner watching her. He delighted in the way she moved as she spun the threads back and forth. The aroma of boiling meat filled the room, making him drool. She turned and grinned; she was as hungry as he looked. This would be a good feast. Alice slipped out of the covers and curled her toes when they touched the cold wooden floor. She pulled her legs up and reached for her thick woolen socks. Once her feet were enclosed in the soft warmth of the wool, she wrapped a large dressing gown around her and walked downstairs. She found her aunt and uncle busily cleaning the kitchen counters. She thought it was odd as breakfast was not on the table but their smiling faces pushed the thought away. Why were they cleaning so thoroughly if they haven’t eaten yet? Her uncle’s large hand on her shoulder made Alice dismiss the thought. She turned and smiled up at her large heavyset uncle. Alice walked to the counter and pulled out the cutlery drawer then began laying the table settings. Her aunt turned to the stove and placed a large skillet on the heated ring, while her uncle picked out sausages and eggs from the fridge. The sausages soon began to sizzle and their tantalizing smell filled the kitchen. When the food was cooked and placed on plates, they sat down to eat. Alice chewed the spicy sausages and marveled at the unusual but delicious taste. The eggs were special too, bigger than Alice had ever seen before with large deep yellow yolks. Alice collected all the plates once everyone had their fill and set them into the sink before turning on the tap. She heard a clickety click behind her and turned swiftly. Her aunt and uncle were smiling at each other and both frowned at Alice’s sudden movement. With her back turned, Alice didn’t see Cattrine punch Gregor’s arm hard. Cattrine watched Alice leave the room then licked her lips. Gregor sat with his head down sucking at his fingertips. Gregor stood slowly blocking out the window with his massive bulk but scuffing his feet like a reluctant child. Cattrine huffed and turned to the cupboards. As she took out a huge pot, Gregor opened the back door and left mumbling under his breath. She heard no answer so began her chores. In the pantry, she unlocked a metal container’s lid and inhaled deeply. Drool dripped from her mouth. She sucked in deeply to return it to her throat. The aroma tantalized her in a way nothing else did. Cattrine pulled out a slab of meat and carried into the kitchen. Footfalls on the stairs made her stop and return to the pantry. She closed the door and stood at the sink waiting for Alice to enter. Alice kissed her aunt on the cheek and skipped out of the door, happy and carefree. Absently brushing away a spot of wetness from her cheek as she walked into the wooded glen. Cattrine returned to the pantry, picked up the slab of meat and began cutting it into strips. Next, she took out a large mincer and fed the strips into the machine. The extruded meat formed a pink and white curl into a bowl beneath it. When all the meat was minced, Cattrine began adding spices and herbs to it. She dug her hands into the mixture and kneaded it repeatedly. Her mouth salivated as she did so. Sorry for the delay – this section is from my novel, Life in Slake Patch, a speculative alternative future novel. Men and women live in separate compounds with visiting on only one day. It is from the viewpoint of the main character, Evan. I’m interested in what imagery you get from this. I entered the laundry to the familiar sound of heavy hoof beats. At the rear of the building were six oxen harnessed to a tread wheel. The motion moved a system of pulleys by way of thick ropes, high in the ceiling. Through a series of cogs the ropes turned wooden struts, which were submerged in large vats of soapy water, twisting the clothes. The water was heated by a furnace situated between the laundry and the brewery house. The machine had been built using a plan found amongst the books in the library ten years previously, which made the laundry duty a much faster and more frequent process. The lye soap aroma had me remembering how I would watch my mother and sister make it. They mixed the lye with melted lard and water then boiled it. I can remember running out of the cabin shouting. Later when the mixture thickened it was poured into shallow pans and once it had hardened I would help cut it into blocks. It was not a favorite chore but once the blocks were completed mother allowed me to deliver some to her neighbors. It gave me the opportunity to play ‘seek and hide’ with other boys in the compound, an enjoyable excursion from chores. Jacob had told me that before the laundry machine had been built, men would wear their clothes until the smell was too much even for them to bear. At that time washing was limited to bashing the clothes with rocks in the river and then only when the river bank was clear of ice. In the winter months, so Jacob says, it was all you could do to sit next to someone. The stench within the long houses had many men risking the bitter winter cold just for relief from it.